L'Oreal Paris introduces a great multi-tasker: a dual ended eyeliner, with a pencil liner on one end and a liquid liner on the other. 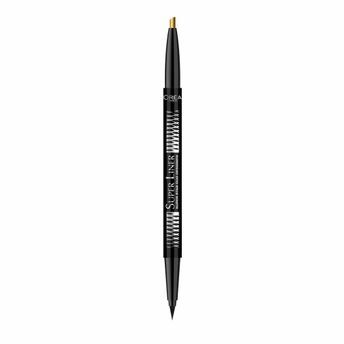 Functional and versatile, the new Superstar Duo Designer has a 24-hour smudge-proof and waterproof intense black formula for creating different eye looks. The dual ended eyeliner features a pencil liner on one end a liquid liner on the other. Delivers an intense black color. Has a 24-hour smudge-proof and waterproof. Perfect for creating various eye looks. Additional Information : A global beauty care brand, L?Or?al Paris believes in the essence of helping every woman embrace her unique beauty while reinforcing her innate sense of self-worth with their internationally renowned, diversive products. The brand has wide range of affordable luxury, high-quality products in categories like skin care, hair care, hair color and makeup. Explore the entire range of Eyeliner available on Nykaa. Shop more L'Oreal Paris products here.You can browse through the complete world of L'Oreal Paris Eyeliner .Alternatively, you can also find many more products from the L'Oreal Paris Super Liner Super Star Duo Designer range.